Over cocktails the 3rd, with neighbors Lil and Dave, Lil asked, “why don’t you join us for lunch with our new neighbors tomorrow?” And, she then quickly said, “oh, I forgot, you will be at Plymouth Notch tomorrow.” Predictable, yes – my friends know me. Ms T., I am flexible, but when it comes to tradition on the 4th of July, you will find me celebrating the birthday of our 30th President – now 145 years old. And, this was the best time there yet. And, for several reasons. 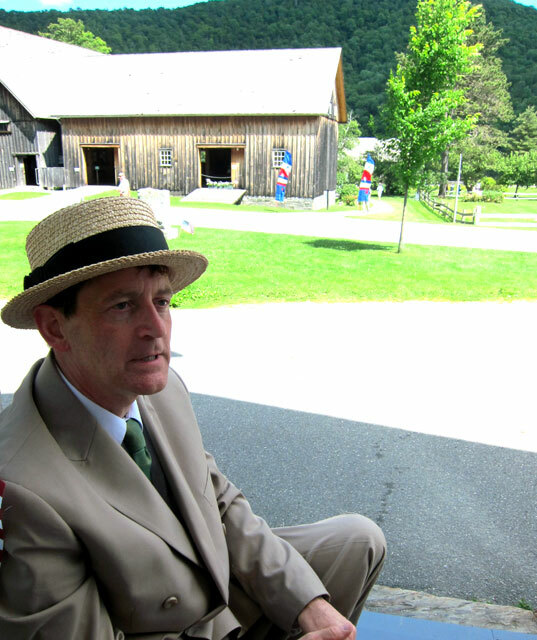 The weather was absolutely perfect, and former Walpole Player, Tracy Messer made his debut as President Calvin Coolidge. 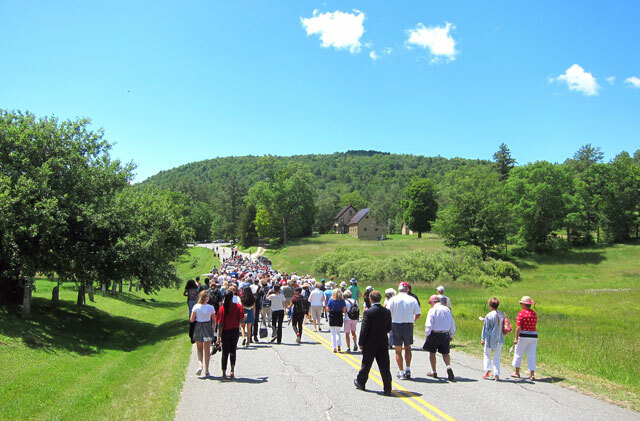 Friend, Carolyn, journeyed with me in BLACK BEAUTY, and we arrived in plenty of time to see the largest crowd (again a relative term in Vermont) yet assembling for the noon parade to the President’s grave. 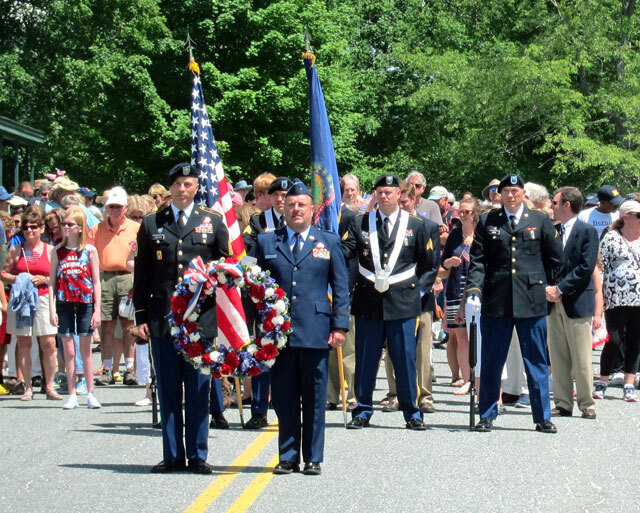 and then it was time for the parade to the Plymouth Notch cemetery to begin. Compare this image to those I have taken in previous years — basically all the same – LOVE IT !!! Laura V. Trieschmann, State Historic Preservation Officer, gave a wonderful speech, and when I saw her later I asked if I could share it with my readers. Many points she made relates the significance of Plymouth Notch, and lessons from history adding to its importance. You will find her complete speech at the end of this post, which I was able to add on July 6th, having received it from Laura. Getting through the all afternoon line for hamburgers and hotdogs it was time for President Coolidge to be interviewed by syndicated columnist Cal Thomas prior to the traditional group reading of the President’s Autobiography. 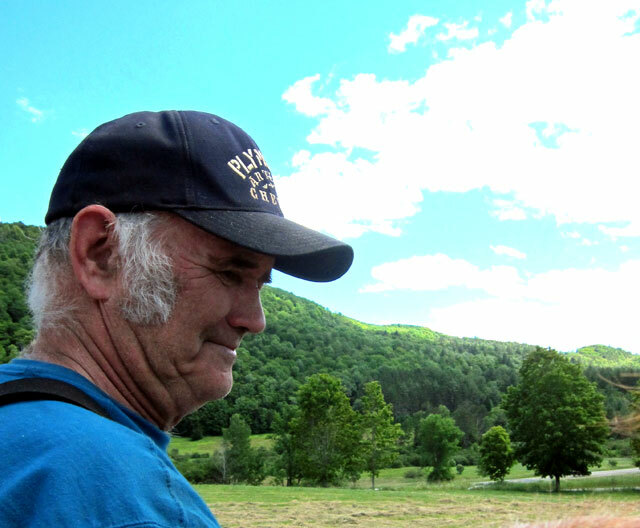 In his fifties, Tracy Messer is a former Walpole Player and intense historian with many connections to our 30th President, who he now portrays. Coolidge Foundation: How did you first become interested in President Calvin Coolidge? Tracy Messer: As a boy, one of my favorite books was an old paperback collection of presidential biographies. President Coolidge intrigued me for many reasons: mostly because he was cut from the same cloth as my Dad, my grandfathers, and their Yankee forefathers. Underneath my Dad’s high school yearbook photo is a quote by the English writer Martin Farquhar Tupper, “Well-timed silence hath more eloquence than speech.” They were all men of quiet action, engaged in their respective families and communities, and endeared themselves to others through their characteristic wit and wisdom. By the way, my maternal grandfather started his career as a dairy scientist working for Department of Agriculture during the Coolidge administration. As a girl, my 97-year-young Mom used to participate in the Easter Egg Roll at the White House while the Coolidges lived there. My Dad was born in greater Boston just as Governor Coolidge was beginning his first term. CCPF: What kind of preparation have you done to portray the thirtieth president? TM: I’m reading everything I can by and about Calvin Coolidge. 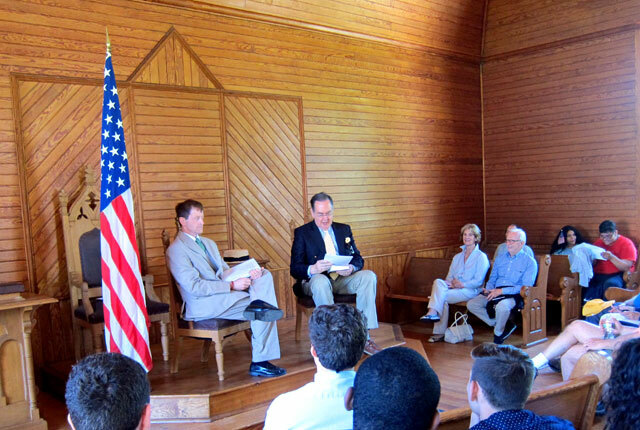 Jim Cooke, Jennifer Harville, and Jerry Wallace have all been wonderfully supportive in sharing their knowledge about President Coolidge. 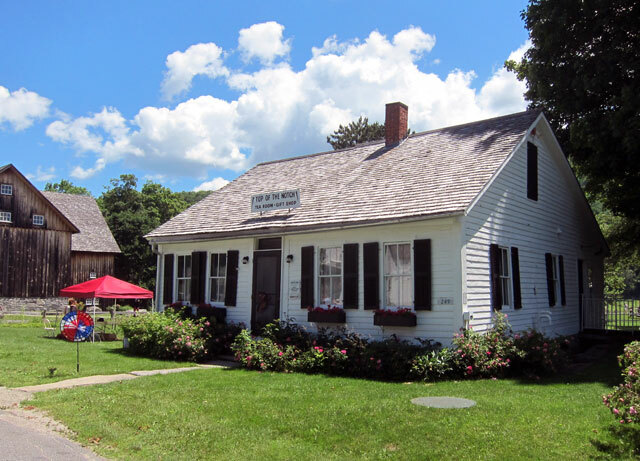 I’ve been visiting various Coolidge-related landmarks in New Hampshire and Vermont and plan to do some more sight-seeing in Western Massachusetts and Boston. CCPF: What is the most difficult aspect of portraying President Coolidge? TM: The initial challenge was practicing his particular brand of Yankee speech. Listening to his recorded voice and recalling my own grandfathers’ patterns of speech helped considerably. Learning the proper pronunciation of local place names is especially tricky. Now, my biggest challenge is going beyond the known facts to begin thinking and acting like President Coolidge. That’s what makes Jim Cooke’s portrayals so fascinating. CCPF: Do you have a favorite Coolidge anecdote? CCPF: What do you view as President Coolidge’s most enduring legacy? Perhaps his most enduring legacy is not his legislative record, but his personal record of leadership with dignity and humility. In his own words he once observed, “It is a great advantage to a president, and a major source of safety to the country, for him to know he is not a great man.” Certainly, he was a good man. For the first time I sat in on part of the reading of the Autobiography, and now I am very anxious to read it. Outside the church the wagon was waiting to give tours, so off we went. 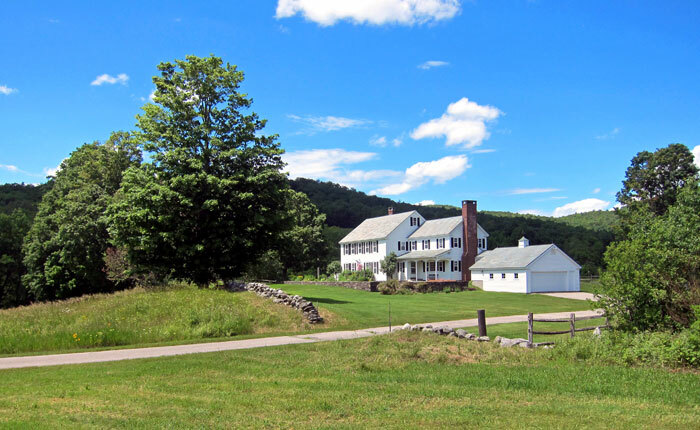 President Coolidge built an addition off the back of his home, but when the State took over the property in 1956 the addition was moved across the field (by the same movers who transported The Ticonderoga from Lake Champlain to its solid ground home at The Shelburne Museum) and expanded. This home remains in the Coolidge family. I always try to sit right behind the driver, as he is a tremendous raconteur. He started, “I had a visitor from Kansas who was complaining because he could not see anything because of all the hills and trees in the way. I told him that is too bad because I understand in Kansas you can see nothing for 50 miles, but standing on a tuna fish can you see 100 miles of nothing.” Continuing he said, “If your dog runs away, you can watch him run for two days.” What can I say, except I should ride with him all day instead of just once a year. The fiddlers who before noon were playing at the Wilder Barn were still playing, but now (three hours later) under a tree between the Wilder House and the Coolidge Homestead. spotting the rocking chairs empty on the porch at the Florence Cilley General Store, we claimed two. We hailed the President (aka Tracy) and he joined us while chugging down a traditional Moxie. For an hour or more he entertained and educated not only us, but others who stopped intrigued. I look forward to helping the President on some of his various projects, and have him speak on Monadnock experiences at the Historical Society’s lecture series this coming winter. And, finally, below is Laura’s graveside speech in its entirety. 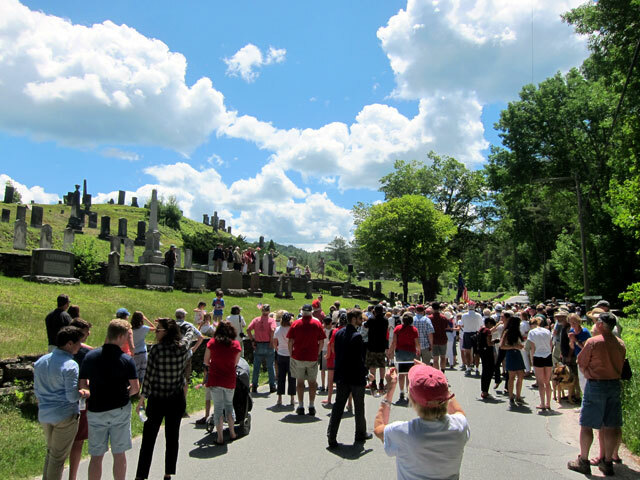 It is my great honor to welcome you on behalf of Governor Phil Scott to Plymouth Notch Cemetery and the President Calvin Coolidge State Historic Site. 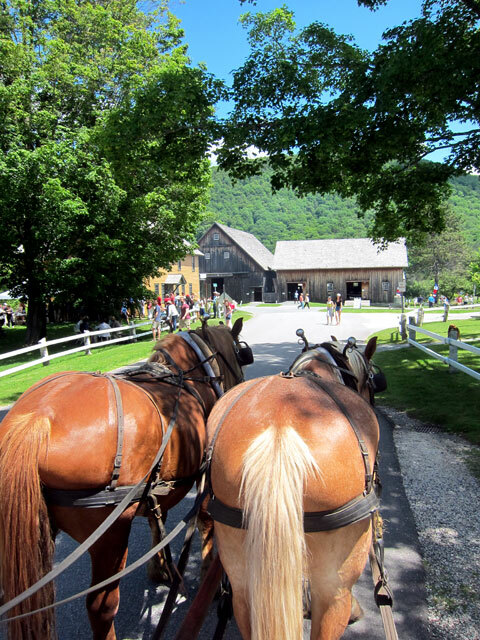 The State of Vermont, now in partnership with the Coolidge Presidential Foundation, has been directly associated with this significant historic site since the 1940s. 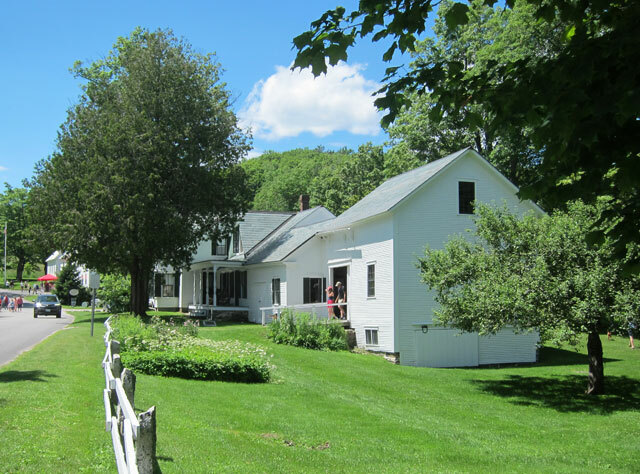 We strive to preserve this site as a museum to Calvin Coolidge and his ancestors, a museum that tells the story of 19th-century Vermont life and farming, a museum that documents the modest swearing in of an accidental president around 2:30 in the morning in August 1923. Not all historic sites should be frozen in time as this one has been, but Calvin Coolidge was who he was because of this place and that is certainly worth historic preservation. Today, we celebrate the 145th birthday of Calvin Coolidge, the only president born on the Fourth of July. The tradition of laying a wreath on the grave of a former president on his birthday began soon after the death of George Washington in 1799, and was informally and irregularly practiced for over 165 years with other presidents. President Lyndon Johnson—at the request of his nature-loving wife Lady Bird Johnson most likely—made the tradition official in the 1960s, with the White House sending a beautiful wreath from a local florist to mark the graves of every presidents on the anniversary of his birth. The sitting president is represented by the Vermont National Guard. In 1872, when Calvin Coolidge was born here in Plymouth Notch, the doughnut cutter and the wireless telegraph were patented, the automated toothpick manufacturing machine was designed, and Yellowstone becomes the world’s 1st national park. In 1923, when Coolidge became the 30th President of the United States here, telephone service between New York and London began but it didn’t reach Plymouth Notch, congressional sessions were first broadcast, and cars, radios, vacuum cleaners, and washing machines become new products available to all households. 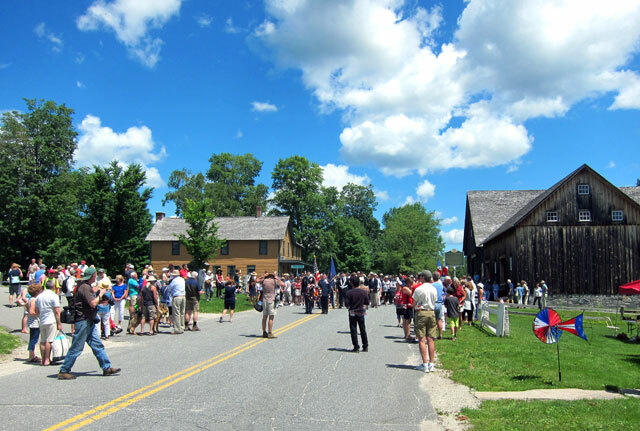 In 1933, Calvin Coolidge was laid to rest at the place of his ancestors here in Plymouth Notch. He was always a Vermonter—despite serving as governor of another unmentioned state and living in Washington, D.C., for nine years to serve first as vice president and then as president. When asked why he wanted to be buried here, he said “we draw our precedents from the people, I came from them, I wish to be one of them again.” Seven generations of the Coolidge family are resting here in this historic cemetery in the Brave Little State of Vermont, and we honor them all. And, just now (Friday 7 July) I stumbled on this fine article in the Rutland Herald documenting the day covering all aspects include Walpole Player Tracy Messer. 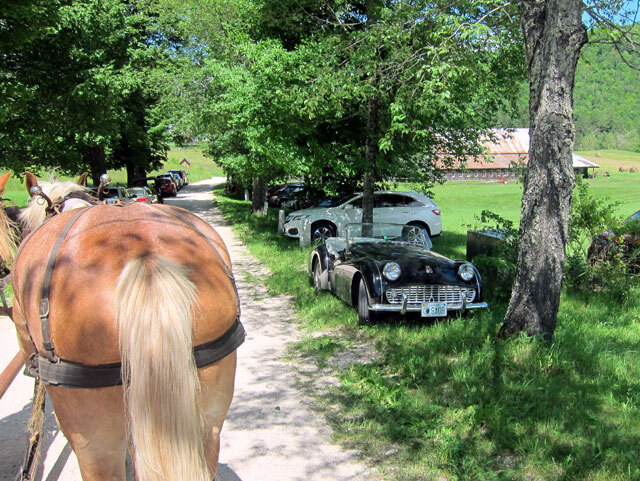 This entry was posted in Plymouth Notch, Vermont. Bookmark the permalink. 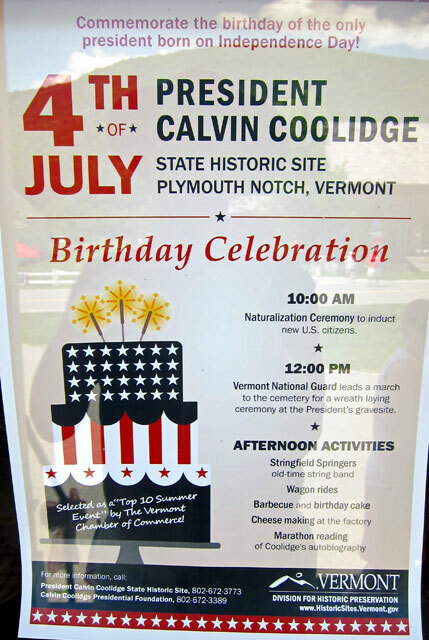 The Vermont SHPO’s speech was a fitting tribute to President Coolidge, who revered his roots. I want to add that he honed his intellect, practiced law, and called home a simple two family house on Massasoit Street in Northampton, Mass. His library resides at the Forbes Library in Northampton, which is also worth a visit. Call first for the open hours. What beautiful weather you had that day! Loved the video of the fiddlers! Of course the tie-in to LBJ and Yellowstone in Laura’s speech was especially interesting to me… As for the driver of the horse cart, if you ever do get to drive all day with him, let me know; I’d love to tag along for the entertainment he gives! As always, an awesome recounting of a great day. Hats off to you!! !